two years ago: Best Yawn Pic Yet! four years ago: Comin’ Atcha! I haven’t seen any pics of Chloe in a while. Is she okay? I never miss a day on this site and I just love how happy Charlie always looks. 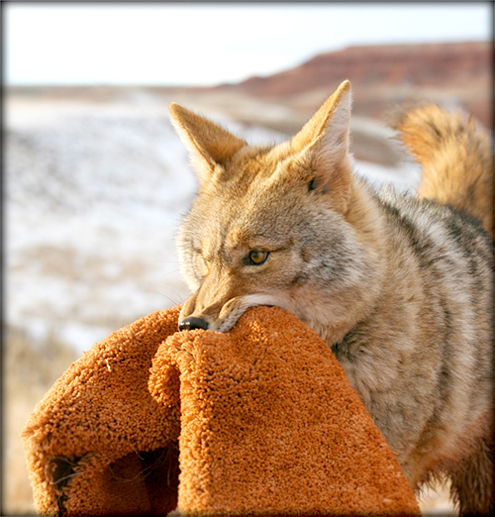 A happy coyote face is one of the best things ever! Cant…. Stuff… Any…. More…. In….. My…. MOUF!!!!! One of the most wonderful things about animals, to me, is how eloquent their body language is. They can express so much, if we have the patience and experience to understand it, without a sound. Charlie just seems to shine with playfulness and bouncing good humor in this image. Well done, Shreve, finding that moment. I am a huge fan of Charlie’s Gumby-like muzzle. I love your pictures and stories of Charlie, great photographs!